If you have followed my blog at all over the last year or so then it probably comes as no surprise to you that I love fall. It’s just absolutely my favorite season for so many reasons. First, many of my favorite people were born in the fall (including my husband, my mom and my sister). I was also married in the fall. On top of that I think that fall has the best sights, smells, and food. How can a row of trees with leaves that have just turned brilliant shades of yellow, orange and red not make you smile? But my favorite part of fall is the pumpkins. Pumpkins for decorations, pumpkin for scented candles and most of all pumpkin for eating! That’s why I knew the moment I saw these that I would be making them and they were everything I thought they would be and more. If you like pumpkin half as much as me then you must try these. Preheat the oven to 350° F. *Grease and flour (or use bakers spray) a 9×13-inch baking dish. In a medium bowl, combine the flour, pumpkin pie spice, baking soda and salt. Stir together and set aside. In the bowl of an electric mixer fitted with the paddle attachment, beat together the butter and sugar on medium-high speed until light and fluffy, about 2 minutes. Beat in the egg and vanilla until well combined. Mix in the pumpkin puree. With the mixer on low speed add the dry ingredients and mix just until incorporated. Fold in the white chocolate chips (and nuts, if using) with a rubber spatula. Spread the batter evenly into the prepared pan. Bake until the edges begin to pull away from the sides of the pan and a toothpick inserted in the center comes out with just a few crumbs, about 35-40 minutes. Transfer the pan to a wire rack and let cool completely before cutting. To serve, cut into 24 squares and transfer to a serving platter. *Annie’s recipe calls for lining the pan with foil, but I didn’t want to mess with it so I just used my bakers spray. I had no problems cutting the blondies and transferring them to a serving platter. So I don’t necessarily think you have to use foil. >Those look delicious! I tried a pumpkin blondie recipe a couple weeks back and it came out too cakey. I think I need to give this one a try. >Great Picture – they look amazing! >Made these & they were a hit! Absolutely delicious. >Will definitely be trying these soon. They look yummy! >Has anyone tried this in the bread machine? >@ Anonymous, I think maybe you meant to ask this question on the pull-apart bread post? If so, I have not personally tried it in a bread machine. I *think* it might work on a dough cycle, but I can't say for sure. If you try it and it works let me know! >Is that correct…that the recipe is calling for 2 sticks of butter? Just wondering. >@Francine – Yes, that is correct. Keep in mind it makes a 9×13 pan. >What type of nuts would you recommend? Walnuts? Pecans? These were delicious and moist. I added cinnamon chips along with the wihte chips. will definitely make again. 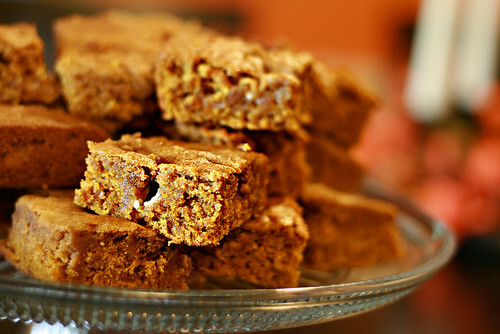 Thanks for finally talking about >Pumpkin Blondies <Loved it!